Paul McEuen (Phys, co-leader), David Muller (ApplPhys, co-leader), Itai Cohen (Phys), Erik Demaine (Math & CompSci, MIT), Robert DiStasio, Jr. (Chem), Jiwoong Park (Chem, UChicago). 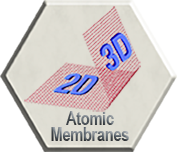 Atomic membranes are a new class of two-dimensional, free-standing materials only one atom thick yet mechanically robust, chemically stable, and virtually impermeable. The prototype atomic membrane is graphene, a honeycomb lattice entirely made of carbon atoms, but other emerging systems such as the III-V boron nitride (BN) materials offer exciting new properties. The central aim of this IRG is to extend miniaturization to its ultimate limit by creating atomically thin 2D “paper” materials that self-fold into incredibly responsive 3D structures with lateral features spanning the mm to nm scales. To accomplish this goal, this IRG will perform the basic materials growth, characterization, and design to make this revolution possible. In specific, we will: (i) synthesize and characterize novel 2D atomic membranes (2D-AMs), analogous to the different kinds of colored paper in origami, (ii) develop approaches to bend and fold these 2D-AMs in response to environmental or external signals, and (iii) elucidate general design approaches to create 3D structures that could ultimately be used for devices with novel physical, optical, electrical, and/or chemical functionalities. Achieving these goals will require new strategies for self-folding as we deepen our understanding of the increasingly more important roles played by van der Waals (vdW) forces and thermal fluctuations at these length scales. Our approach will build on the fact that biological nanosystems (e.g., proteins and DNA/RNA) adapt to this regime by working in aqueous solutions. Such dynamic liquid environments will allow us to unfold and actuate these complex nanostructures.